The Ozone Exoceat race harness is now available to order. Fred, Luc or Russ can tell you most about this harness, but it is built to complement wings like the Ozone Enzo 2 to give maximum performance. 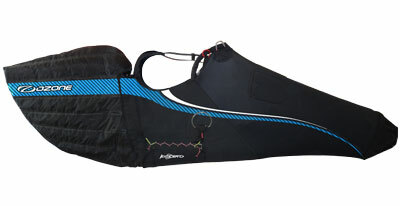 The Ozone Exoceat is a low-drag high-performance harness for serious XC or Competition flying. It is the result of a multi-year development process which included extensive testing, and wind-tunnel research, and a prolonged beta phase involving the worlds top competition pilots. The result is a unique and totally new design that we think is the perfect complement to our highest performing wings. A lot of development time has gone into perfecting this ozone exoceat harness including the ‘bomb doors’ for deploying either of 2 possible reserves, satisfying the latest safety requirements for competition pilots. Place your order with us now!!! Harness Weight (includes: Carabiners, dummy rescue, cockpit, back bumper).